Time to make the Easter Pie. And this one is not a concoction. This one's from my family archives!! 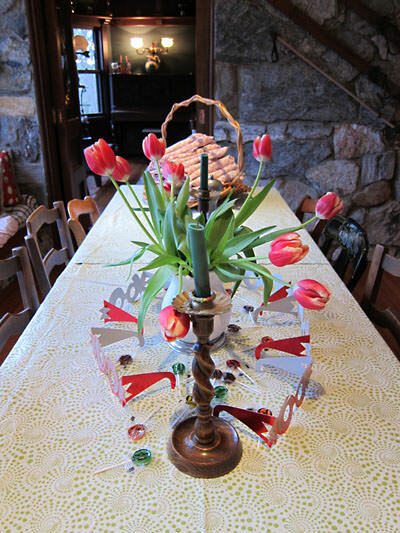 The cooking is always the centerpiece of our holidays. But today I want to reflect on life, being alive and grateful for all I have. It is Earth Day today. It is Good Friday. Be cognizant of the beauty of nature and our need to save and preserve. Be grateful for the mysteries of this wonderful life and the religious ceremonies that seek to explain and celebrate our great earth and all its creatures. Never take any of it for granted - life, the planet, friendships, great food and family!! I just spoke one of my best friends in the whole world and learned that the tumor in her brain doubled in size in 6 months and she must have surgery. My heart aches for her and yet, I am in awe. She is brave and calm. So this Easter, I pray for AnneMarie. There are certain religious traditions that I can embrace. One of them is eating fish on Fridays. It's a great habit to get into because fish is so good for you and it's delicious!! 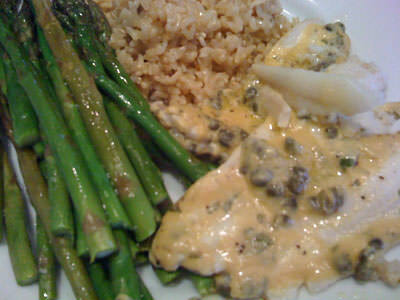 Here's a simple and delicious recipe I developed: Dover Sole with Mustard Caper Sauce. Serve with roasted asparagus and brown rice for a healthy and delicious supper!! 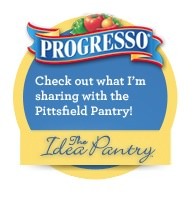 Testing and Tasting Progresso's new products - very FUN! Sometimes I am so focused on the food that the decor takes a back seat. 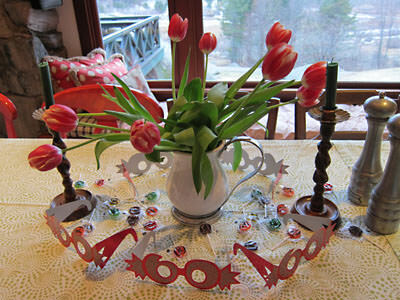 But fortunately, some great tulips, a bright tablecloth and some tacky decorations from a local party store saved the day. What do you think? That's what I am!! Back to normal - I think! Bewteen the wacko health journey and the death of my sweet Guinea hen - Uni - I have been functioning on empty. Doing what's necessary. So, I will be back at my post - blogging again and sharing....so stay tuned - lot's brewed in my head while I was healing!! Klara Sotonova could be a poster child for Heirloom Meals. Klara is from the Czech Republic. She came to the United States 11 years ago to improve her english language skills and broaden her horizons. You will “hear” that her language skills are certainly honed and you will learn that Klara has made Lee, MA her home. 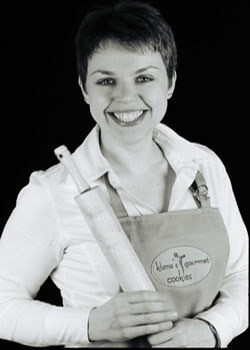 Klara has created a business, Klara’s Gourmet Cookies using her great grandmother’s cookie recipes. Klara’s story is sweet, heart-warming and inspirational!! And her cookies are amazing! !